I didn't really enjoy my time at Central Tech - one day a week release from my job as a trainee draughtsman but too much homework and because I had accelerated entrance - due to my Grammar School record - I also had to take technical drawing at Selly Oak Tech, one evening a week. So my memories tend not to be related to education - I've managed to blot that out. You may not believe this but I was also courting my wife (now of 47 years married bliss), playing league table tennis, learning the trombone with Northfield Silver Band, going to watch Aston Villa every other Saturday and going fishing on alternate Saturdays. At the age of 19 I was worn to a frazzle. A few memories which may not do much to help Carl (of whom I've heard, of course). If you look at the photo there is a small building on the left attached to the college. This was a cafe when I was there and a friend and I skipped classes to go in there to listen to the commentary when Hungary thrashed England at football in 1953 - a seminal moment in English sport. 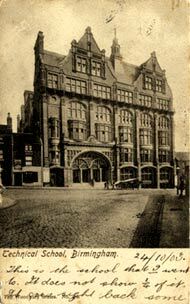 Across and up the road (Suffolk Street) was the West End cinema. Another afternoon we skipped classes to see Bwana Devil - the first 3D film. We had to wear special glasses and all ducked when a spear was thrown 'out of the screen'. Finally, the senior technician in the Heat Engines lab was an expert at table tennis. He used to supplement his income by challenging students to play - with an added bonus. He would place a box of matches on each corner of the table. Every time you knocked one off your opponent had to pay a small pre-agreed sum. He could hit them every time. None of us had much money and the cheapest thing at the canteen was Oxo. You paid a penny (old money) for the Oxo cube and they gave you hot water, pepper and salt for nothing. Hope I haven't bored you with those reminiscences. By the way, I was born in Lower Tower Street, between Newtown Row and Summer Lane - which we always called Aston but, I suppose is more properly Lozells (I would like you view on that). I went to school at St George's - while the church was still standing. In 1936 I caught polio but was fortunate to survive with just a withered leg. An unnamed German bomb aimer pushed the button at just the right time to demolish our back-to-back house and so I escaped to the leafy(?) suburb of Northfield at the age of seven. My wife and I were both part of the team that designed the Mini at Longbridge before its launch in 1959. We lived in Rubery, Bournville and King's Norton before moving to the Welsh Border in Shropshire some 16 years ago. It's a bit different to Lower Tower Street!